This web site is intended to be more than just a quick reference to find out more about an astronomer, instrument etc. It is also intended to serve as starting point for research. For this reason, the section on sources becomes of utmost importance. Every fact mentioned in the web site must be verifiable and show researchers the way where to find more information. Referring to the above paragraph, it would be appreciated if, when anyone notices incorrect information, or has additional data, to forward to me with the proper reference, please! Primary written sources: These are the original written sources that a researcher use. These are the documents created by the person that you are researching, i.e. letters, notebook, logbook, etc. It can also be the printout made by a machine, e.g. the reading made by a spectograph. The importance of these sources, are that they are closest to an event with no interference / interpretation by any historical researcher. These sources are usually found in an archive. Secondary written sources: When a historical interpretation is added to a document, it cannot be a primary source anymore. For example, when I do research about an event, in order to write an article, I come to certain conclusions. These conclusions are my point of view! They are my bias that becomes imprinted on the subject. Therefore articles, theses, report etc. are now considered as secondary sources as they are one step removed from the event. Exceptions to the rule always occur. An example where a secondary source may be a primary source, is where you look at a report written by an astronomer about an event, to see what his biases are, concerning a topic. These sources are usually found in the libraries of institutions like Universities, Observatories etc. Tertiary written sources: Books are usually tertiary written sources. Authors rely on reports, thesis (secondary sources), to assimilate an incredible bulk of material into one book. Books are thus another step removed from the actual event. Tertiary sources are usually found in ordinary libraries. Pictorial sources: These are images (pictures) of an event. It can be photos, video material, paintings, drawings, lithographs, etc. These sources can be found anywhere from private possessions, archives, art galleries, etc. Physical objects: The best example is probably the physical remains of a meteorite. Telescopes, scientific instruments etc. fall into this category. They are usually found in museums. In the text of the different sections of this web site, there are references to the sources in an abbreviated form. In the text itself, the reference may be as follows [Moore, p.?] In the Bibliography the references are more complete, e.g. 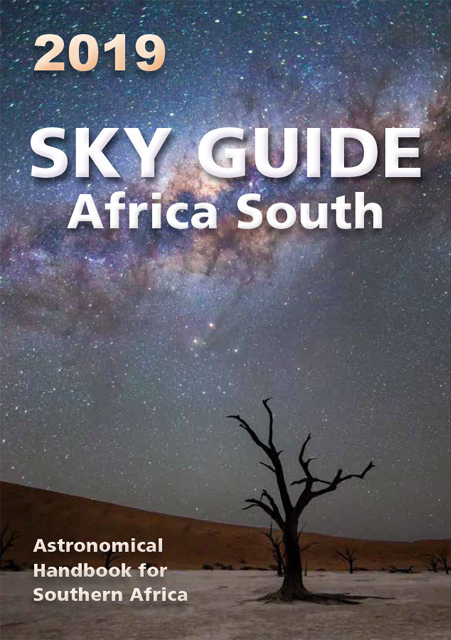 Moore, P. & Collins, P., Astronomy in Southern Africa, p. ?. In this section, the full reference will be given. The reason for giving references, is so that other people can also find the source where the original researcher found it. The pieces of information are added together in a structure that is the accepted norm by Historians. For the purpose of the web site, the author will not worry too much about the finer details of the structure, since references from a variety of sources were copied and then added together. They all have a little variation to each other. / Pages where article appear. 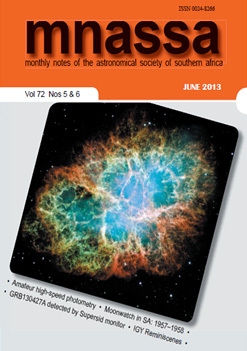 Example: Warner, B.: ASTRONOMICAL ARCHIVES IN SOUTHERN AFRICA; Journal for the History of Astronomy, (Hoskin M.A.[ed.]) Science History Publications Ltd, England, Vol. 8 (1977) pp. 217 – 222. (R 11) A reference as the example R 11, written in red in my original documentation, refers to a questionnaire that was send out to persons / institutions relating to the History of Astronomy. When information was gathered in personal contact from individual it will be acknowledged as [Personal Communication with ? ; cdc]. The information could have been transmitted verbally (Oral Source) or in a written from e.g. letter of e-mail. The acknowledgement refers from which person but also t whom. Below follows a list of abbreviations of the persons who recorded the information for the website.